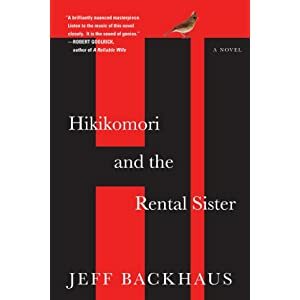 Hikikomori and the Rental Sister by Jeff Backhaus. The book is being released by Algonquin on Jan. 8, 2013. Amazon says this about the book: Thomas Tessler, devastated by a tragedy, has cloistered himself in his bedroom and shut out the world for the past three years. His wife, Silke, lives in the next room, but Thomas no longer shares his life with her, leaving his hideout only occasionally, in the wee hours of the night, to pick up food at the grocery store around the corner from their Manhattan apartment. Isolated, withdrawn, damaged, Thomas is hikikomori. Desperate for one last chance to salvage their life together, Silke hires Megumi, a young Japanese woman attuned to the hikikomori phenomenon, to lure Thomas back into the world. Back in Japan Megumi is called a “rental sister,” though her job may involve much more than familial comforts. At first Thomas remains steadfast and sequestered, but as he grows to trust Megumi, a deepening and sensual relationship unfolds. In this revelatory and provocative debut, Jeff Backhaus asks, what are the risks of intimacy? And what must these three broken people surrender in order to find hope again? Hikikomori and the Rental Sister celebrates the human capacity to find beauty and meaning in life, even after great sorrow. It tears through the emotional walls of grief and delves into the power of human connection to break through to the world waiting outside.